I just LOVE when I get to save our prospective residents money! For all residents who move in during the month of April I can help you save $5,000 off your rent for the first year. I visited Brookdale, and I liked what I saw. The staff was friendly and helpful, the place was clean, and it was a good atmosphere. The residents looked well-kept, and were socializing. The grounds were clean, I saw an area where they watch TV, a place where they have their hair done, and the dining hall, and everything was well-kept. The price was lower than the other places I looked into. Brookdale Marietta was very nice and clean. They had a dining area for the people, and the rooms were nice. All the people were nice there as well as the staff. Visited a family friend that has moved into the community. Nice atmosphere, welcoming. Everything looked to be clean and the residents seemed happy. I didn’t like Brookdale Marietta. As far as the cleanliness and the staff, I was not impressed, and it was farther away than I wanted it to be. It's close to the gentleman’s family, but they already indicated that they would not be visiting. They offered double rooms or shared rooms. I think the staff was very caring and interested in presenting their facility at Brookdale Marietta (Emeritus at Spring Mountain), which was very nice. It seemed to be very clean. It was well equipped. The people who are living there seemed happy. It looked like a very nice facility. They were very informative with how they do things. Overall, it was a good experience. It was very impressive. I thought Brookdale Marietta was very crowded, and it had a smell. I was not so impressed with it as I was with the other places I visited. It was a two-level facility, which I did not care for. The staff looked like they were doing their job well. They seemed to be competent. They play movies, and they have special outings. I went to Brookdale Marietta for a tour. The staff was very nice, and they answered all my questions. Their room is very nice. They have exercise classes and craft classes as well. Their dining room is like a dining at a restaurant. The facility appeared to be very secure. Brookdale Marietta is better, but it is too far. The rooms are still small. They have levels of care added on that made it expensive. I didn't really consider it. There was nothing wrong with it, but it wasn't a good match. I didn't have any problem with the sanitation. Thank you for visiting and taking the time to share your thoughts about our community. We realize that our rooms are smaller than many expect. Most of our residents are downsizing, which can be a difficult transition. Please be assured that we are passionately committed to serving our residents and our goal is to provide an individualized plan of care to fit our residents' needs. We went to the Emeritus at Powder Springs Road. I didn't see too much of the staff at the time but the person that took us through was very nice. They seem to have many activities. I have seen their bus several times. There is also a small shopping center right next to them. When we left after our tour, I have seen one of the aides taking one of the residents over to the shopping center. If the residents are well enough, they actually took them over there. They appear to have many activities. The room I saw was very nice. It is a single with a private bath. I don't think it had a mini kitchen. I don't remember seeing a separate sink or a microwave. We didn't eat there because we came in right after lunch, but they did have several staff members going around refilling coffee cups. My mom liked Brookdale Marietta. The folks there were very pleasant. The only thing that I would say bad about it was that it took one of the residents to come up and ask us how we were doing. We were in the management office for almost an hour, and they didn't realize that we were there. However, everybody that was there seemed to be very excited about the activities. There was a man that was there, and in the 15 minutes that we talked, he must have hugged 30 times. People were just coming up, and they wanted to know what was the next thing to do. I thought if my mother were to move to Georgia, she would have chosen that facility because she just thought everybody was pleasant and happy. They were in the process of redoing a fitness area. I couldn't speak to what the facility looked like today, but with everything that they were talking about, it was very encouraging. Everybody was so upbeat, and you would feel left out if you wouldn't participate. That's one thing that I looked forward for my mother. She was a social person, and that would have been fine. Hopefully, we will have our dad moved in by the first week of February at Brookdale Marietta. It is a very beautiful place. It has a very nice and very elegant dining room. I believe it has two floors. They have an activity room with a big TV, and they do field trips. The rooms are very nice, and they are fairly big for what my dad needs. We are really very pleased with it. Everything is fine about the staff at Brookdale Marietta. They were able to help me during the visit. The rooms are clean and roomy. They didn't have any pets. They had a TV, and that's about it. To improve the place, they could keep the people busy instead of them just sitting around twiddling their thumbs. I have visited Brookdale Marietta, and it was my least favorite from all of them. There weren't any residents hanging out in the main area. I wanted socialization for my dad. That was important to me. I like the part that they have an on staff nurse that could dispense medicine whereas all the other assisted living facilities could not do that. The rooms were average. I like that they're just a Dementia or Alzheimer's place. I like that he didn't have to start in one room and move as he progressed. Another thing I liked is that the nurse has a dog, and all the residents treated it as their own. That was nice. I was impressed with Emeritus at Spring Mountain, but it was further away from us. The room that they showed me was spacious, but I think it was a suite. The facility was fairly new. It was nice and clean and seemed to be well staffed. Emeritus at Spring Mountain was the closest to the family. It was very clean, very nice, and everyone was friendly. The rooms were very nice and clean. I did like how they have their own laundry facility where the residents could do their own laundry if they wanted to, but not necessarily in their rooms. My visit at Emeritus was probably for about 3 weeks. I just kept popping up and going at any given time of the day. The staff was the same, the people, all of the residents, whenever I went there, were very happy. The environment was pleasant and well kept. I spoke with the executive director, Shelley. Everybody was talking to me, and they came and did a personal visit with my grandfather. So the whole transition seemed to work with me a whole lot better. They just made me feel warm, and then I felt comfortable that they were caring for my grandfather. He loves it there. He's so happy, so it worked out great for all of us. He says the food is good. Occasionally, we go there and I pick him up and we go and have dinner. But if the food was bad, he would definitely complain about that. I know they have lots of activities because they have a schedule that they put out daily of all the activities, like movies and lots of games. My grandfather is not big on activity, so he doesn't get that involved. But they've been very busy. They have all kinds of parties and all kinds of stuff. We visited Emeritus at Spring Mountain and we were actually not in the need for anything right now, we were just seeing what it was like. This facility is the one we like most because of its proximity to the little shopping area. Their entry way was very nice and comfortable looking. They have a patio and a place where visitors could socialize. We were told that residents could have people come over for special occasion. We like the outside as well because there were pathways that you could walk about and there were trees that made it more country-like. At other places, the scent of aging was really strong, but in this place, the smell was very pleasant. As far as staff, the person who showed us around was very amiable, interesting and answered every question we had. She was thorough about everything. Their residents seemed quite friendly. What stood out with this facility is the interaction and the relaxed look on all of the guests here. The first thing I noticed about Emeritus at Spring Mountain was its beautiful yet quaint atmosphere. It has an extremely comfortable vibe as soon as you drive up. Once you get inside, it's even nicer, with a beautiful sitting area. The staff were extremely friendly and answered every question I had. We were taken on a tour of the premises, which included a nicely decorated dining room, a social activities room, spacious bedrooms, an outdoor gazebo, and more. What I liked the most, however, was the extended health care services that this facility offers and the way the staff was able to ease my concerns about medication reminders and physical therapy. They also offer an individualized care plan for each resident, which is the main thing that my grandmother needs, given that her situation is a bit unique. Overall, I was incredibly impressed with The firs thing I noticed about Emeritus at Spring Mountain was its beautiful yet quaint atmosphere. It has an extremely comfortable vibe as soon as you drive up. Once you get inside, it's even nicer, with a beautiful sitting area. The staff were extremely friendly and answered every question I had. We were taken on a tour of the premises, which included a nicely decorated dining room, a social activities room, spacious bedrooms, an outdoor gazebo, and more. What I was the most impressed with Emeritus at Spring Mountain. We have visited several other assisted living facilities in North Georgia and this one, hands down, has been the best I've experienced so far. Visited twice. First in the summer of 2011 for my aunt. Place was very clean and they had a young woman in charge of thier activities. The palce was popping. I could smell the food from the kitchen and the staff came out of thier way to say hello. The activities person came over and talked to me, she seemed to know her stuff. I also enjoyed talking to the woman at the front desk. I return to the facility recently, this time for a friend. My aunt passed away before I coud get her in. They had a new look. IThey also had new staff, this included a new activities person. The pop corn was going and staff still nice but there wasnt the same "popping" action. A resident said they didnt have anything to do. The new paint and decor was nice. I got some booklets from astaff member and she was nice and helpful. Didnt seem like the same place but all was ok.
A friend of mine's Mother and Grandmother had been living at Spring Mountain, and I occasionally visited to be supportive. I was extremely impressed with the staff as well as the elegant but "at-home" feel of the Center. Compared to others that I have visited, Spring Mountain has a pleasant atmosphere - from both the Staff and the occupants. There wasn't anything "Medical" about. The residence were treated with the utmost honor and dignity. Decorated with beautiful up scale and antique furniture, I had more of a feel that I was in a 4 star hotel, verses a nursing and memory care home. Though I was initially nervous about visiting, the entire atmosphere put me at ease and I was pleasantly surprised. Sadly, the Grandmother died about 3 weeks ago, but again the treatment by the staff of this occasion was very honorable and dignified. If my Mother ever needs more care than I can give her, I would be very happy with her being in a place such as Spring Mountain. THE PLACE IS ERY CLEAN AND THE SERVICE IS EXCELLENT, IM THINKING OF PUTTING MY GRANDMOTHER IN THE PLACE IN THE NEAR FUTURE. i did some volunteer work here it was very calm and quiet. the staff were very nice especially with the seniors. the seniors seem to love karoke thursdatd. The center was very clean and quiet. Everything was neat. The staff did every thing by order and on a precise schedule. The rooms are very spacious and I saw employees doing housekeeping work. However in a few of the rooms i did notice trash cans that had not been emptied, other than that the senior seemed well taken care of. Professional Service and Care: Our trained and certified staff are available 24 hours a day, seven days a week and led by full-time, licensed nurses. Our staff receives constant oversite from our Medical Director who also performs routine resident visits. Each residence is equipped with a state-of-the-art emergency call system. 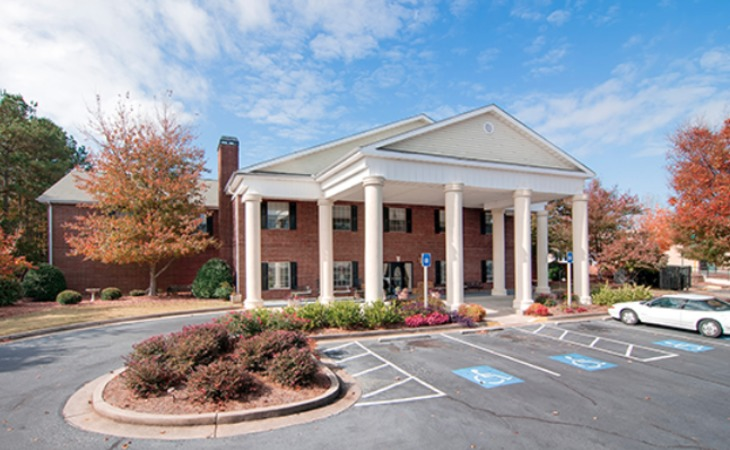 The Heritage of Marietta is a Senior Living Community for seniors in Marietta, Georgia. Less than five miles from two major hospitals and near major shopping centers, our community features a park-like setting, including a courtyard, walking paths and gazebos. What should caregivers and potential residents know about The Heritage of Marietta?